CHICAGO — Entertainment services are by far the most likely services to be purchased by libraries in the next year according to a recent survey of more than 300 libraries in North America. Join us for this free webinar on Wednesday, Oct. 10 at 1 p.m. 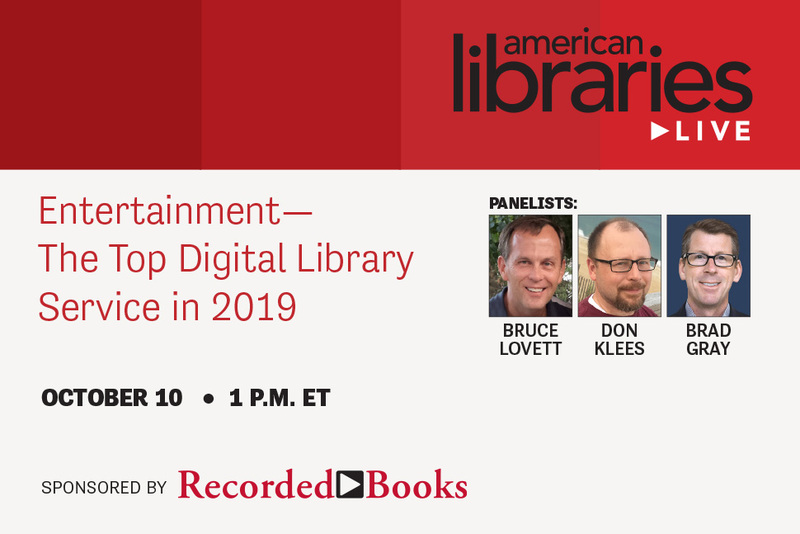 ET where we’ll discuss the results of a recent nationwide survey on entertainment and other digital services in libraries, including which specific entertainment service topped the list as most likely to be added in the coming year. Our special guest, Don Klees from Acorn TV, will delve into the content of this popular service offering world-class mysteries, dramas and comedies from Britain and beyond (including a peek into what’s new and coming soon). Join us for this free 60-minute webinar on Wed., Oct. 10 at 1:00 pm ET. You can register here. Bruce has 20-plus years of experience leading marketing and product organizations in the technology marketplace. In the last seven years his focus has been on marketing to schools and libraries with specific emphasis on digital content. Don Klees came to Acorn TV after working as a multimedia buyer for Borders Books & Music and other retailers. He has been leading Acorn TV's programming efforts in North America for nearly 15 years and, in recent years, has focused on the evolution of Acorn TV's content strategy. Brad works with libraries worldwide to help them improve the patron experience when accessing digital content. This webinar is sponsored by Recorded Books. Recorded Books is the largest independent producer of audiobooks in the world, with a catalog of more than 35,000 exclusive titles narrated by award-winning actors. In addition to the highest-quality audiobooks, Recorded Books also offers eBooks, magazines, comics, a range of streaming video services, educational offerings, and more. The company’s RBdigital app also delivers the library industry’s broadest array of digital content services to millions of consumers. Founded in 1979, Recorded Books is an RBmedia company. American Libraries Live cover the full spectrum of library topics. Each program lasts 60 minutes. With the help of real-time technology, it’s like having your own expert on hand. To receive e-mail reminders, register here. If you’re unable to attend live, this event will be recorded and available at americanlibrarieslive.org/al-live shortly after it concludes.